8827 Minifigures Series 6 is a series of Collectable Minifigures that was released on January 9, 2012. This series introduces 18 new pieces. This series, Series 7, and Series 8 will have the most female minifigures, at five each. This series will be the first to not have a part made of cloth. This series has the most minifigures with special moulded heads, at three. There was a television commercial with all the minifigures parodying television shows and movies. WHSmiths stores in England started selling Series 6 in late 2011. Each minifigure is counted one time for the amount of pieces. This is a description taken from LEGO.com. Please do not modify it. 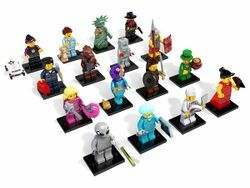 Collect all 16 new LEGO(R) Minifigures from Series 6! A surprise each time! You never know which Minifigure is hiding inside the sealed "mystery" bag. Bandit with a bandana and two pistols. Butcher with a t-bone steak and cleaver. Classic Alien with ray gun. Clockwork Robot with a turn key on his back. Genie with a magic lamp. Flamenco Dancer with a fan. Highland Battler with a shield and sword. Intergalactic Girl with a ray gun. Lady Liberty with a torch and book. Leprechaun with a kettle and three gold pieces. Mechanic with a wrench and toolbox. Roman Soldier with a shield and a spear. Skater Girl with a skateboard. Sleepyhead with a teddy bear. Surgeon with a syringe and an X-ray. Some of the Series 6 minifigures with a VIP minifigure on LEGO.com. Facts about "8827 Minifigures Series 6"
Collect all 16 new LEGO(R) Minifigures from Series 6! This page was last edited on 11 August 2016, at 15:46.